Men often wear knitted shirts and slacks with a roomy fit. When you plan to buy golf clothes, check with your golf club or the course you play to find out if a dress code is in place. Often, clubs require men to wear shirts with a collar, trousers, or shorts with a longer length. Women may also face some restrictions. If you want to look like a player, visit a golf shop and check out some of the stylish and functional clothes designed for golf. Golf is a pastime steeped in tradition. Since the game was invented in Scotland hundreds of years ago, golfers have given a lot of thought to what they wear on the course. Players of old wore tweed, plaid, knickers or “plus fours,” and golf caps. As of 2010 we see hints of traditional golfing attire in the cardigan, buttoned sweaters worn by both men and women, and the classic tartan plaids and hats associated with golfing. Golfers of today have the advantage of newer materials used in clothing. Players look at the technological advances in the fabric while choosing clothing that is in fashion. Much of the golf clothing on the market today is moisture-wicking to keep you dry, while filtering air to keep you cool. Another feature of golf clothing is wrinkle resistance, so you look as fresh on the 18th hole as you did on the first hole. Women look for fashionable golf clothing cut with a roomy fit to allow for a full golf swing. While golf shorts, long pants and Capri length pants are in fashion as of 2010, some women opt to wear skirts or skorts, a combination of shorts on the inside and a skirt on the outside. Golfers look for clothing with deep pockets to accommodate balls and tees. Some women look for coordinated golf outfits that include a matching vest or lightweight jacket along with a golf shirt and pants, shorts or a skirt. Sun visors and hats, sunglasses, belts and handbags are accessories women use on the course. 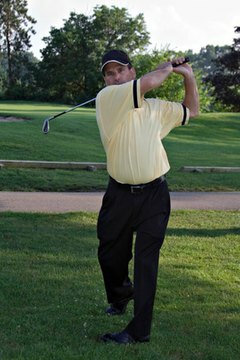 Most male golfers wear a collared, knitted “golf shirt” with a pair of golf pants cut with a roomy fit. Some enjoy wearing eccentric colors and patterns like plaid as a salute to tradition, along with knit cardigan sweaters and two-tone spectator shoes. Short “Eisenhower” jackets, made popular by President Eisenhower, who enjoyed golf, are still in style today. On cool days, a knitted golf vest keeps the arms free while warming up the torso. Since golf is played outdoors for several hours, golfers usually have “an eye on the sky” when they set out to play a round. After listening to weather reports, both male and female golfers may bring along a windbreaker or water-resistant jacket. Water-resistant slacks and sweaters are available at golf shops.